Students at Portsmouth College are in the process of planning a beneficial event for Thursday 2nd May 2019 to collaborate with a community called Global Music Visions C.I.C. During this event the students and participants from GMV will be recording instruments and producing musical pieces based around the theme ‘Journeys’. This closed event will demonstrate how disabled and visually impaired people still have the same abilities as any musician who has vision, as well as allow students to work within the local community. Global Music Visions C.I.C. also known as GMV is a non-profit community interest company. They specialise in helping visually impaired and disabled people through workshops to create music and play instruments. The manager and founder David Shervill, who is also visually impaired, quoted on his website that he built GMV “to bring the benefits of music to as many blind, visually impaired, and disabled children and adults as possible, by using computer music software technology”. Since the start of GMV which started in 2015, have been gradually removing the stigma and prejudice surrounding people who have a disability. David Shervill has broken down barriers that prevent equality and inclusion for people who want to produce and create music but suffer judgement on a daily basis. His workshops create new musical opportunities based on a person’s ability and ideas, and not based around their disability. This allows the people who are passionate about music to enjoy what they love doing best and for others to try something new. The students from Portsmouth College organising the event are a Year 2 BTEC Music Technology class. 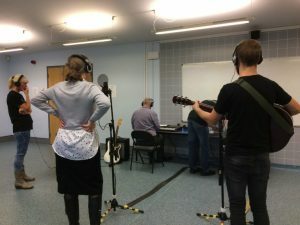 Throughout the two years of the course, each student has participated in a number of recording sessions in the college studio and outside using our portable equipment. We have also proudly donated our time and equipment to the community by visiting different secondary school music students. Where we set up workshops to recorded the students playing instruments, as well as them being taught how to record correctly as part of our Studio 101 project. As a class and students of Portsmouth College, we are proud and excited to be planning this event for GMV. This will open up a new perspective to us and everyone that anyone and everyone of all abilities can perform and produce music.